George E. Leach was a Colonel of the 151st Field Artillery, the Minnesota unit of the Rainbow Division. The Rainbow Division was composed of National Guard units from across the country. 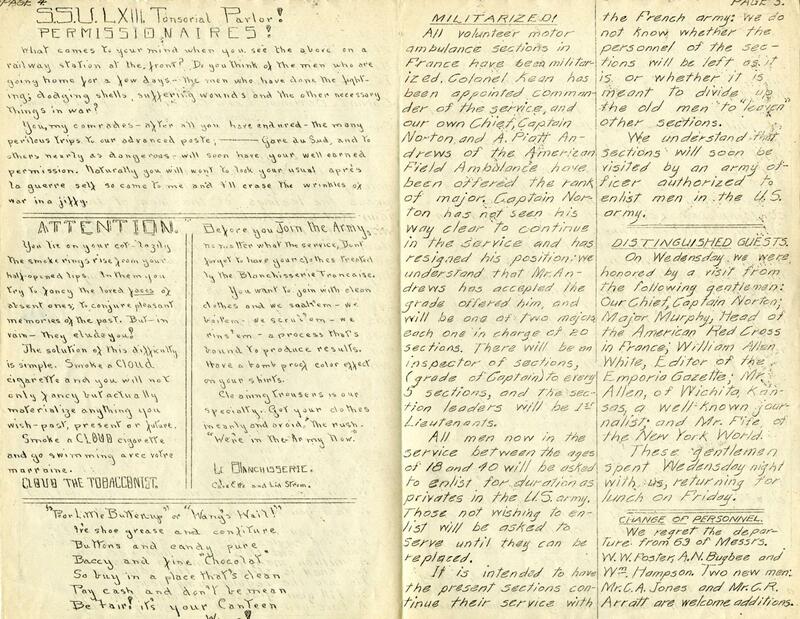 Leach kept a diary while in the service because he was aware that his father, Captain William B. Leach, regretted not keeping an account of his own service in the Civil War. 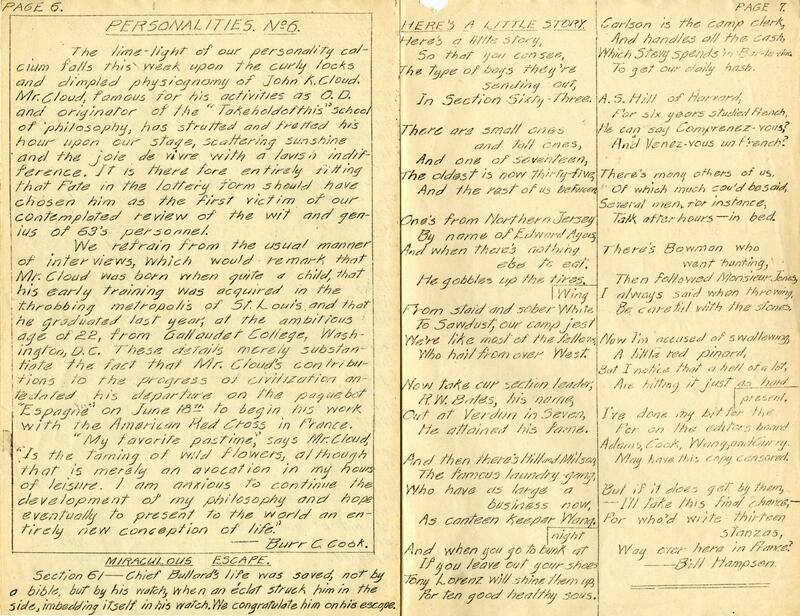 In his first diary entry, George Leach has his father's service at the forefront of his mind as his Regiment begins its journey overseas. Broke camp at Fort Snelling at two P.M. and marched down the same road with the Regiment that my father marched down with his to the Civil War and at six-thirty entrained on our first leg of the journey to France. The regiment was carried in two sections. This is a Paul Molitor bobblehead doll with commemorative card and cardboard box. The set was distributed at Minnesota Twins game against the Cleveland Indians, 2004. For more information or to purchase a photograph of this item, view this bobblehead in our collections database. 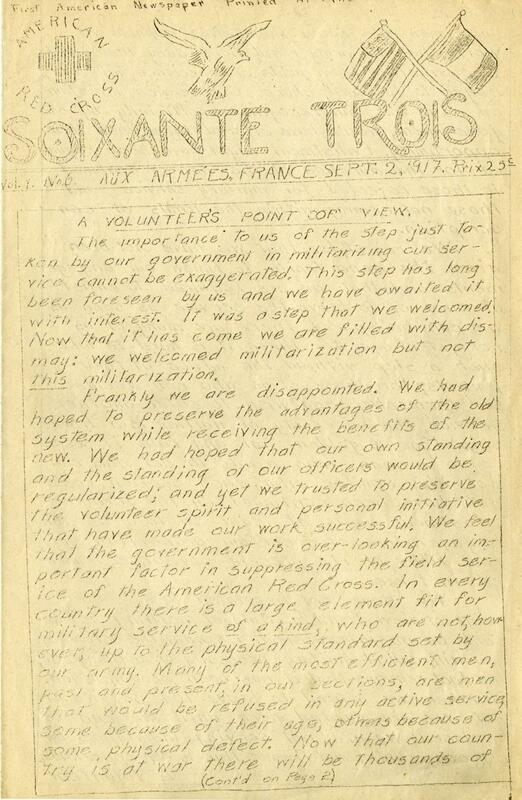 In the sixth issue of Soixante Trois, published in France by St. Paul Red Cross volunteer ambulance driver Ezra Curry, the main topic is the militarization of the volunteer motor ambulance sections in France. Curry was a member of the 63rd Section of the Norton-Harjes Ambulance Service until it was taken over and militarized by the United States Army. Most issues of the newspaper feature news from the front, personality profiles, poetry, cartoons, and even advertisements. Curry is specifically mentioned in a poem "Here's a Little Story" on page 7. A Volunteer's Point of View. The importance to us of the step just taken by our government in militarizing car service cannot be exaggerated. This step has long been foreseen by us and we have awaited it with interest. It was a step that we welcomed. Now that it has come we are filled with dismay: we welcomed militarization but not this militarization. Frankly we are disappointed. We had hoped to preserve the advantages of the old system while receiving the benefits of the new. We had hoped that our own standing and the standing of our officers would be regularized; and yet we trusted to preserve the volunteer spirit and personal initiative that have made our work successful. We feel that the government is over-looking an important factor in suppressing the field service of the American Red Cross. In every country there is a large element fit for military service of a kind, who are not, however, up to the physical standard set by our army. Many of the most efficient men, past and present, in our sections, are ment that would be refused in any active service, some because of their age, others because of some physical defect. Now that our country is at war there will be thousands of such men who know themselves capable of work that the army regulations deny them, and who, whether from pride or conscience, will be eager to do their share. Our service, maintained as it was, but recognized officially by our government, woul dhave offered these men their opportunity. 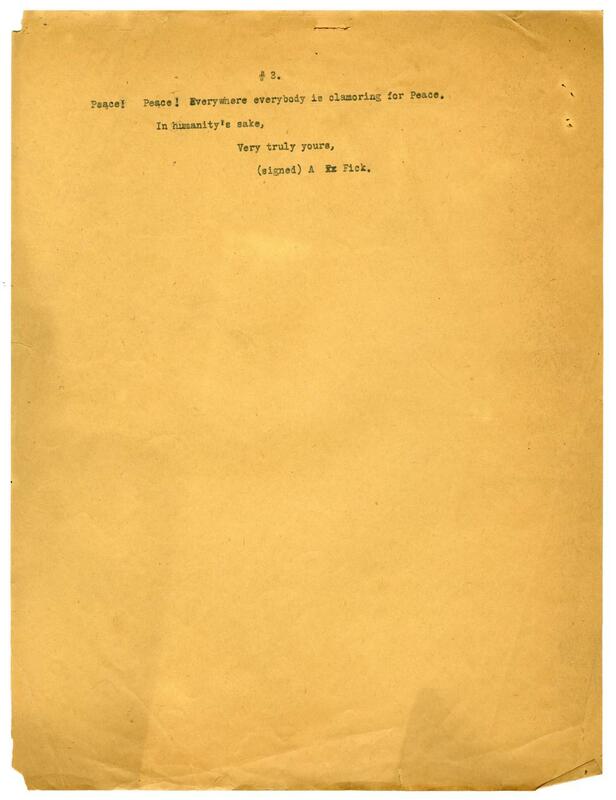 Enlistment might have been required for the duration of the war or confined to those rejected for military service and those not coming within the limits of conscription. 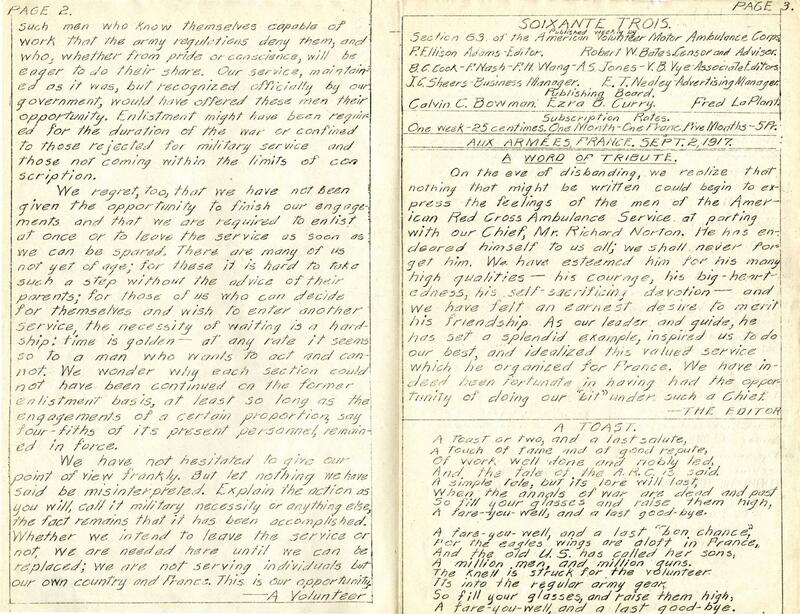 We regret, too, that we have not been given the opportunity to finish our engagements and that we are required to enlist at once or to leave the service as soon as we can be spared. There are many of us not yet of age; for these it is hard to take such a step without the advice of their parents; for those of us who can decide for themselves and wish to enter another service, the necessity of waiting is a hardship: time is golden - at any rate it seems to to a man who wants to act and cannot. 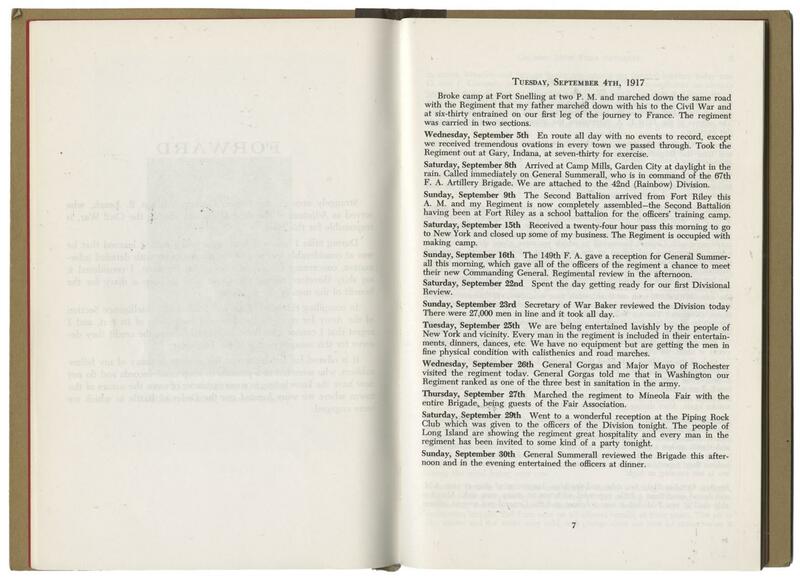 We wonder why each section could not have been continued on the former enlistment basis, at least so long as the engagements of a certain proportion, say four-fifths of its present personnel, remained in force. We have not hesitated to give our points of view frankly. But let nothing we have said be misinterpreted. Explain the action as you will, call it military necessity or anything else, the fact remains that it has been accomplished. Whether we intend to leave the service or not, we are needed here until we can be replaced; we are not serving individuals but our own country and France. This is our opportunity. -A Volunteer. 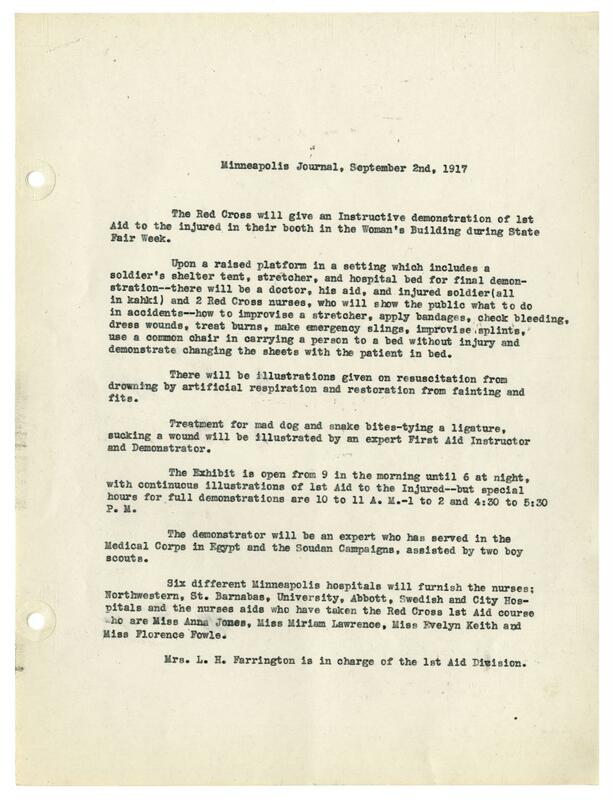 A September 2nd article in the Minneapolis Journal described Red Cross First Aid demonstrations, which would be held at the Minnesota State Fair that very week. Each day, at the Women’s Building from 9 am to 6 pm, members of the public could watch a variety of demonstrations, most of which were more relevant to daily accidents than wartime casualties. 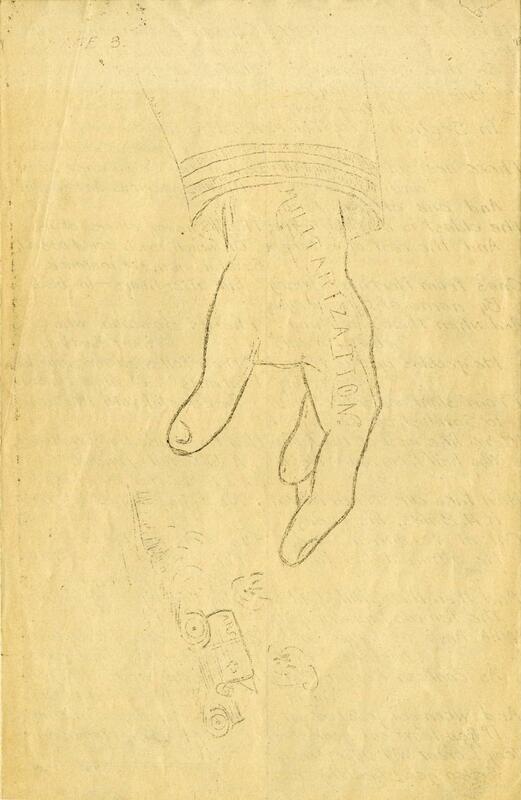 Topics included the treatment of dog and snake bites, resuscitation from drowning, application of bandages, treatment of burns, and improvisation of stretchers. Often, these demonstrations employed everyday objects such as newspapers, blankets, and even matchboxes, in order to mimic the resources available to ordinary citizens. Each demonstration featured two Red Cross nurses, which were recruited from six local Minneapolis hospitals, and a doctor’s assistant recruited from the Boy Scouts of America. 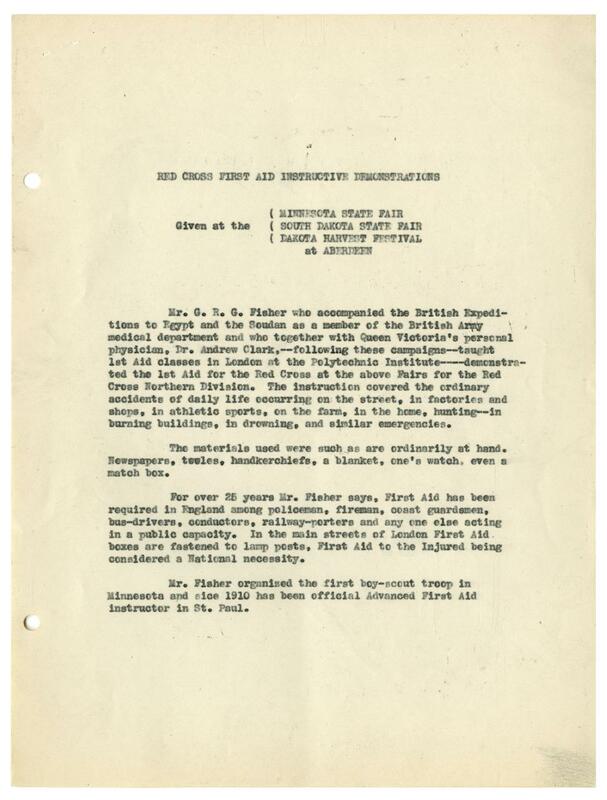 The man in charge of these demonstrations was Mr. G. R. G. Fisher, a former member of the British Army Medical Corps who had served in their Egypt and Sudan campaigns. He viewed First Aid as a national necessity, even outside of wartime, and he brought this philosophy to the St. Paul area. 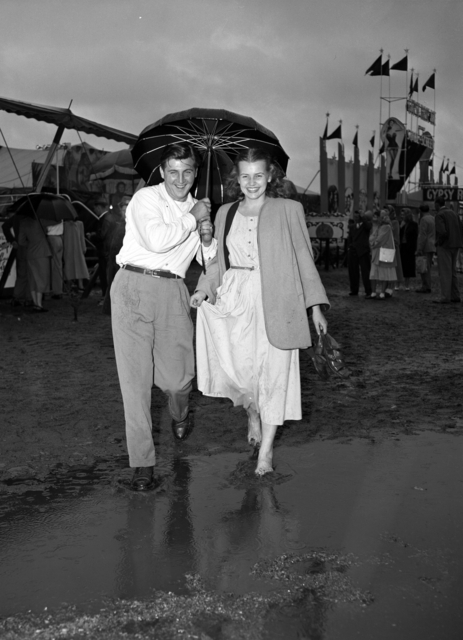 This is a photograph of a couple walking through the flooded Midway at the 1949 Minnesota State Fair. 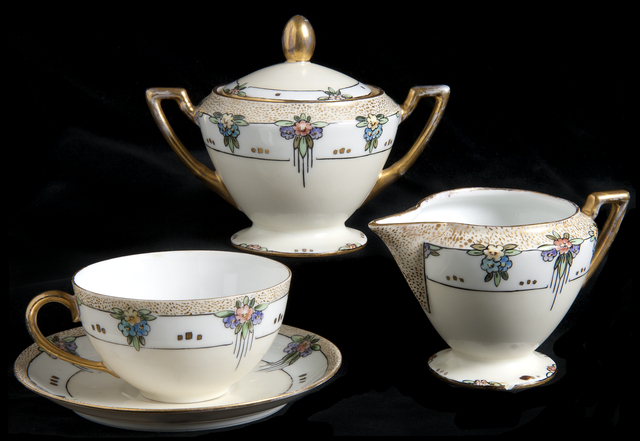 A porcelain tea set including a creamer, covered sugar, cup and saucer, all hand-painted by Emily Jane Crane in the 1990s. Gaylord, Minn., August 30, 1917. I am taking the liberty to write you concerning the question nearest every American heart, the question of peace and war. In every hamlet, in every village, in every city, the people are overwhelmingly opposed to the war we are waging. They all agree that it is the most unjust of wars. They say we can not be fighting for our rights when we do no slso [sic] declare war on England who first violated our rights. England was the first who violated international law. She spread explosive mines all over the North Sea up to Iceland as early as November, 1914, and sand [sic] three American ships with loss of life, the Greenbriar, the Evylin, and the Carib. [...] And is it fighting for democracy when we by the point of the bayonet impose a government upon aforeign people they do not want. Let us look out for our own democracy first. 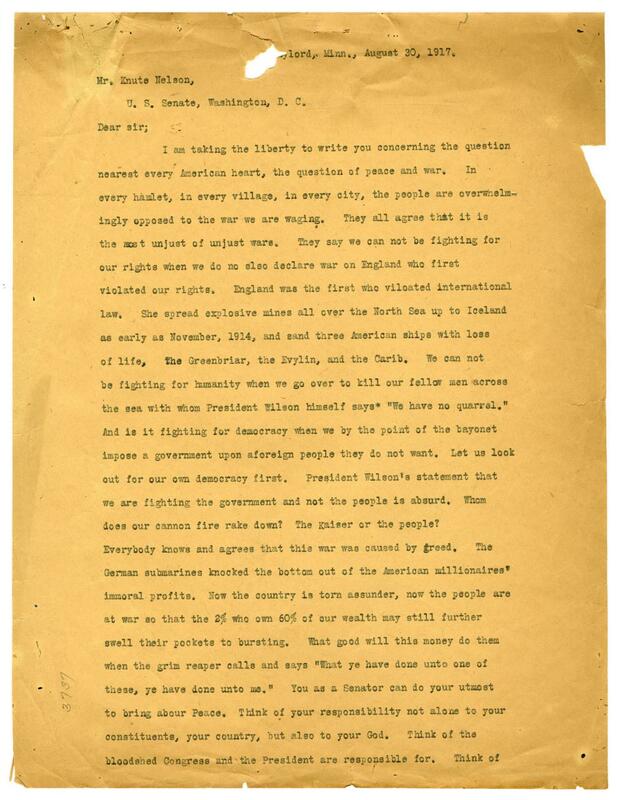 President Wilson's statement that we are fighting the government and not the people is absurd. Who does our cannon fire rake down? The Kaiser or the people? Everybody knows and agrees that this war was caused by greed. The German submarines knocked the bottom out of the American millionaires' immoral profits. Now the country is torn assunder, now the people are at war so that the 2% who own 60% of our wealth may still further swell their pockets to bursting. [...] You as a Senator can do your utmost to bring abour [sic] Peace. Think of your responsibility not alone to your constituents, your country, but also to your God. 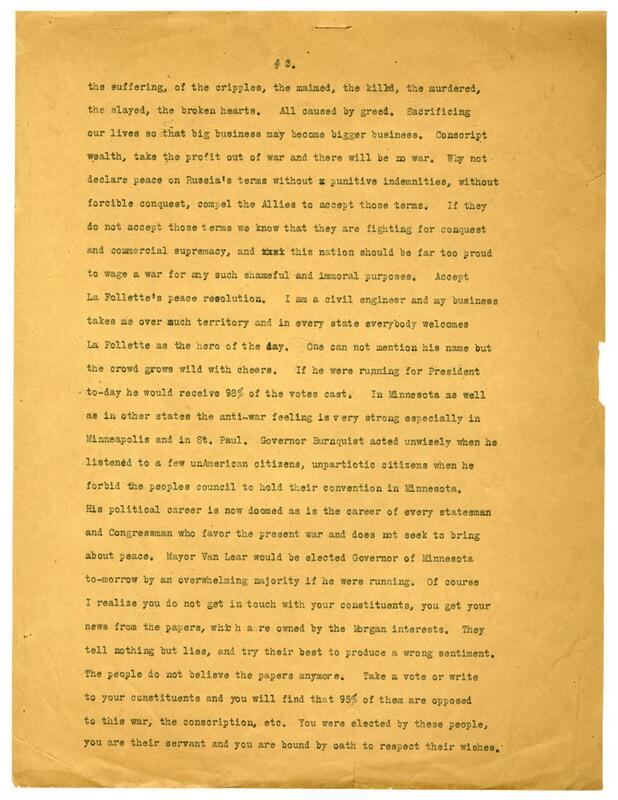 [...] Accept La Follette's peace resolution. I am a civil engineer and my business takes me over much territory and in every state everybody welcomes La Follette as the hero of the day. [...] In Minnesota as well as in other states the anti-war feeling is very strong especially in Minneapolis and in St. Paul. Governor Burnquist acted unwisely when he listened to a few unAmerican citizens, unpartiotic [sic] citizens when he forbid the peoples council to hold their convention in Minnesota. [...] Of course I realize you do not get in touch with your constituents, you get your news from the papers, which are owned by the Morgan interests. They tell nothing but lies, and try their best to produce a wrong sentiment. The people do not believe the papers anymore. Take a vote or write to your constituents and you will find that 95% of them are opposed to this war, the conscription, etc. You were elected by these people, you are their servant and you are bound by oath to respect their wishes. Peace! Peace! Everywhere everybody is clamoring for Peace. 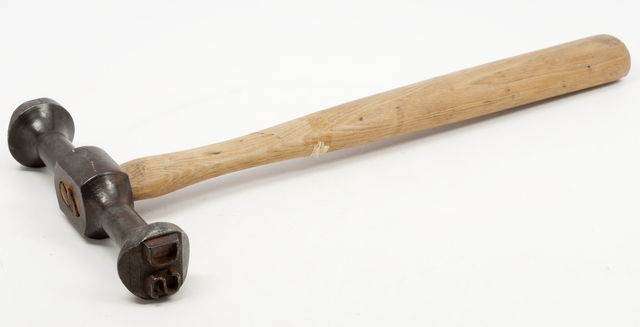 This is a hammer-like tool with steel head and "DS" in raised reversed letters on either end to stamp railroad ties. Manufactured by Panniers, Pittsburgh, Pennsylvania, 1940-1990. For more information or to purchase a photograph of this item, view this tool in our collections database.